Curated by Sarina Basta, this exhibition presents the work of students and graduates of the Beaux-Arts of Paris and guest artists who place pedagogy at the center of their practice, or who use representation of pedagogy as form. The exhibition includes John Baldessari, Joseph Beuys, and Martha Rosler among many others. A section of the exhibition is dedicated to Josef Albers, and a selection of works created with his students throughout various moments of his carreer at the Bauhaus, Black Mountain college and Yale University. Saisies du reel is yet another section of the exhibition which exhibits pedagogical objects of the collection of the Beaux-Arts from the 16Th century until today. 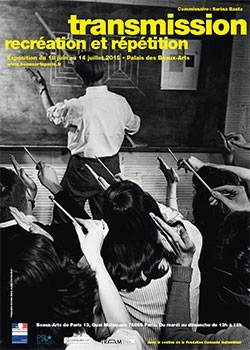 Rita Ackermann, Josef Albers, John Baldessari, Joseph Beuys, Thierry Boutonnier, Travis Boyer, Kasper Bosmans, Kim Bradford, Atelier Bruguera, Zoé Capdevielle, Greg Castéra, Paul Créange, Édouard Cuyer, Bady Dalloul, Alexandre Damerval, Nicolas Darrot, Mark Dion, Guillaume-Benjamin Duchenne, Albrecht Dürer, Robert Filliou, Mara Fortunatović, Mats Gustau, Isabella Hin, Thomas Hirschhorn, Jean-Antoine Houdon, Jean-Auguste-Dominique Ingres, Max Jefcut, Pablo Jomaron, Yaël Kreplak, Jean-Gaspard Lavater, Franck Leibovici, Christophe Lemaitre (with François Lancien-Guilberteau, Aurélien Mole, Sarah Tritz), Naomi Lulendo, Diogo Maia, Benoît Maire, Robin Jiro Margerin, Léonard Martin, Michel-Ange, Olivier Mosset, Nils Norman, Yoshua Okón, Élisabeth Péleraux, G.T. Pellizzi, Philomène Pirecki, Polydore, Morgane Porcheron, Pablo Prieto, Eileen Quinlan, Marthe Ramm Fortun, Paul Richer, Martha Rosler, Tanguy Roussel, Clara Saracho de Almeida, Camille Sauer, Pierre Seiter, The V-Girls, Théophile Stern, Mladen Stilinović, Christelle Tea, Cheyney Thompson, Victor Vaysse, Ana Vega, Marta Wengorovius, Adolphe Zimmern, Mathieu Zurcher.